The sign on Teton Pass marking the descent into Jackson Hole. Once upon a time spectucular scenery and wildlife-watching opportunities found in few other places in the world provided all the adrenaline a person needed. 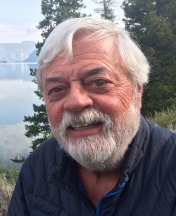 Living in Jackson Hole now for 48 years, I felt a need to share some of my frustrations of how things in the “Hole” have changed–and continue to change. While detailing these concerns, I realized that by simply changing the specifics of my Jackson Hole musings, I was describing nearly every recreation-based resort community in the West. From Montana’s Whitefish Mountain Resort to Snowbowl Resort in Flagstaff Arizona, and from Vail Colorado to Mammoth Mountain in California, we are witnessing a shift in how summer visitors experience their destinations. Not all that long ago, summer visitors focused on exploring an area’s unique cultural history and landscape wonders, now they are attracted to outdoor experiences built upon engineered contraptions and landscapes reconstructed to provide adrenalin-filled adventures- many of which could be provided in Central Park, if New York authorities so permitted. Let me begin my lament by stating that Jackson Hole is in the midst of this very transition- we are making a not-so-subtle shift away from our tradition of recreating simply, lightly and thoughtfully on the land to now embracing a host of newer, faster paced and artificially enhanced outdoor activities. This shift, driven by locals and visitors alike, represents a significant departure from our “Old West” pallet of summer experiences highlighted by dude ranches, hiking, fishing and scenic floats on the Snake River. In the not so distant past, the ultimate Jackson Hole experience had to include an extended horse pack trip deep into the picturesque wilds of our public lands. If today’s visitors even want a horse experience, it’s seldom for more then a few hours and rarely extends deep into the backcountry. Regarding today’s backcountry experience, the goal seems to be how far and fast can we get into the wilds on mountain bikes before heading back to town in time for that cold brew. Today, it seems a resort isn’t a resort, if it doesn’t include a rope course, zip lines, bungee jumping, and railed coasters and tubed slides. Throw in a few built mountain bike courses along with mini golf, disc golf, tower jumping and “pop jets” and one has to ask: at what point does a resort become an amusement park? We recently constructed a boulder park in the town of Jackson—the main hub of the valley—and now Snow King Mountain Resort which is etched partially into the steep slope of Forest Service land rising above town is proposing an indoor climbing wall and sports training facility. In addition, they are proposing “gravity fed” down hill mountain bike courses and a 3,700-foot zip line with speeds reaching 70 mph. We have a long and distinguished history of whitewater and scenic rafting on our Wild and Scenic rivers and streams. Now there is a push by some kayakers to construct a standing wave white-water play park in the Snake at the South Park landing. "We used to find freedom from our busy lives by hiking the valley’s trails and relaxing in the quietude of wild nature. Now we have ear buds streaming whatever into our auditory cortex. Or worse, we encounter those who insist on sharing their booming mini-box music with everyone they encounter." We used to find freedom from our busy lives by hiking the valley’s trails and relaxing in the quietude of wild nature. Now we have ear buds streaming whatever into our auditory cortex. Or worse, we encounter those who insist on sharing their booming mini-box music with everyone they encounter. At what point does the once uniquely low key and wild Jackson Hole become one grand amusement park? Some would argue that any time people get outside and off the pavement there is a chance they will develop an interest in their environment, and hence become responsible environmental stewards. Perhaps, but how does flying down a zip line faster then the county’s posted speed limit for vehicles generate appreciation for the calliope humming bird you can’t see feeding on the carpet of wildflowers far below? And how does scrambling through a spider web rope course of “wobbly bridges, swinging logs, climbing nets, flying surfboards and zip lines”–to the accompaniment of boom-box music, help one appreciate forest canopy ecology when its wild residents have abandoned the area? "Some would argue that any time people get outside and off the pavement there is a chance they will develop an interest in their environment, and hence become responsible environmental stewards. Perhaps, but how does flying down a zip line faster then the county’s posted speed limit for vehicles generate appreciation for the calliope hummingbird you can’t see feeding on the carpet of wildflowers far below?" Or how does a mountain biker screaming and careening over a manufactured ”back country” jump garner appreciation for the elk and deer long departed from the scene? Or how does continually surfing a man-made, standing wave create understanding for the bald eagle and river otter no longer fishing that stretch of the river? 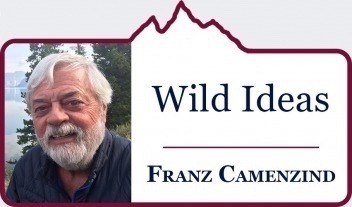 It may be challenging, it may be exciting, and it likely generates an adrenalin and cash flow high, but does it create appreciation for the pure wilds we claim to cherish? Or the “Old West” way of life we proudly claim as our brand? How does riding a $6,700 GIANT Trans E+ SX Pro electric mountain bike at break-neck speeds correspond to “Dudes” ambling along on a string of packhorses? And what does it teach of our past, the proud role our predecessors played in the history of America’s conservation movement? 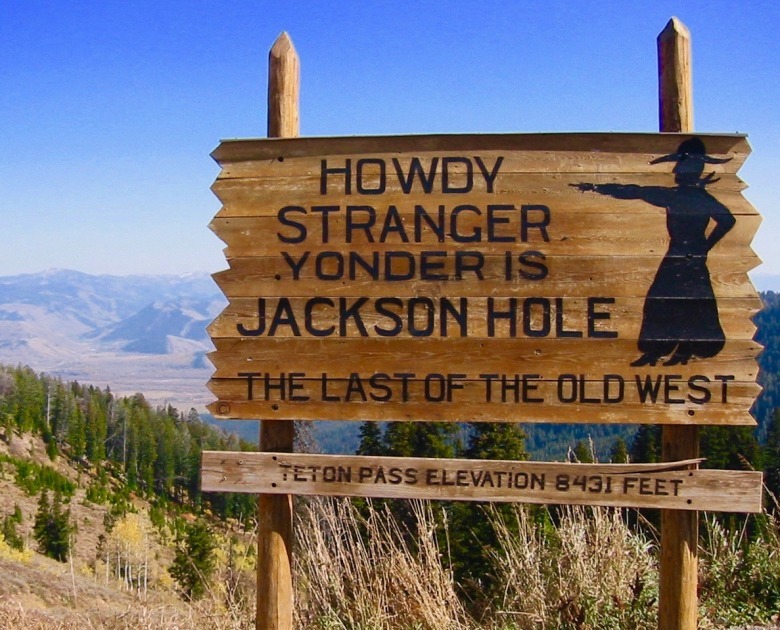 At the rate we’re zipping toward a manufactured Jackson Hole experience, perhaps it’s time to make a pilgrimage atop Teton Pass and ceremoniously remove the 80-year old sign proclaiming: “Howdy Stranger—Yonder is Jackson Hole, Last of the Old West” and use the boards to craft a rustic coffin within which to bury that last of the old-timers- the character of Jackson Hole. Have we entered an era in society’s evolution where outdoor recreation is now more manufactured then natural? Are we entering a time where local cultures are being supplanted by experiences designed by what can be built within the broad constraints of the setting—of the landscape? When will we be in a place in this experiential evolution where we can go anywhere and experience nothing but variations of the same? If we continue down this contrived path, not only will we risk loosing touch with our cultural history, but we will have cut our ties with the real and meaningful natural world- the place of our origins, the foundation for our future. When we reach that critical mass where nature is seen as a place of manufactured memories, whom, then will care for the wilds they no longer know?